BROOKFIELD Properties is readying plans for four towers totaling 4.7 million feet at the rear of the Farley Post Office on the west side of Ninth Avenue between 31st and 33rd streets. "It will be an awesome location," Ric Clark, Brookfield's CEO, said at the Young Men's and Women's Real Estate Association luncheon yesterday. Clark said plans call for the east end of the plot to host two office towers sharing 4 million square feet while the west end will have two residential towers totaling 700,000 feet. They hope to kick off marketing the northern office tower of 1.6 million square feet within the next few weeks, for delivery in late 2010. That process will begin with the sharing of new renderings now being prepared by Skidmore Owings Merrill. While there's no anchor tenant yet, Clark said Brookfield is in discussions with "all the usual suspects" and expects rents to start in the $80 range. Would they break ground without an anchor tenant? "Never say never," Clark said. "But we would need to know the Moynihan Train Station was going forward." Last edited by NYguy; Feb 22, 2008 at 3:18 AM. They hope to kick off marketing the northern office tower of 1.6 million square feet within the next few weeks, for delivery in late 2010. 2.4 msf would be a pretty tall building. I hope these buildings get built soon. Why do I smile at people who I'd much rather kick in the eye? I hope so. It's a small plot for 4 buildings, so there has to be one or two of these towers that are 600ft+. ^^ Maybe for the residential. 2.4 msf is most likely around 1000ft. BoA is 2.2 msf. But first, they have to build a platform over the railroad tracks. That takes a long time. Great news. This will really help to link the Midtown skyline with the upcoming Westside skyline. 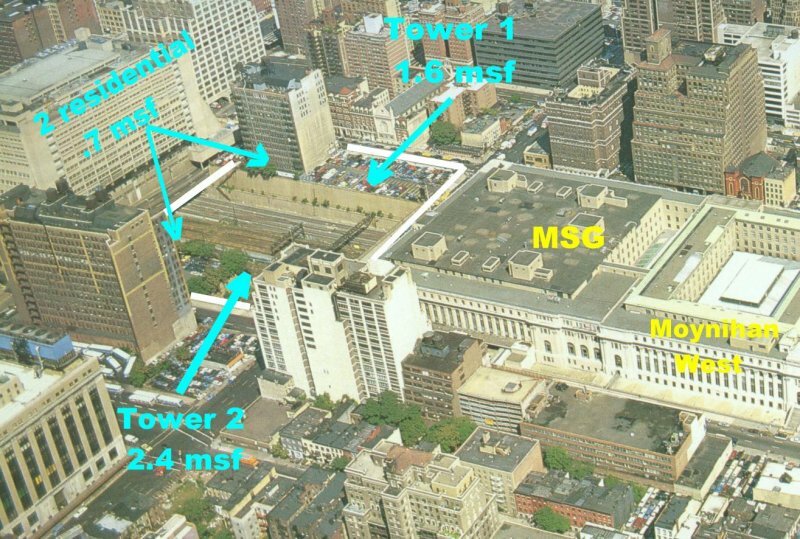 I hope the 2.4 msf tower is 300 meters +, I'm sick of Midtown and the city picking scrapers in the range of 250 meters. NO MORE PEOPLE, LET'S MOVE IT UP A COUPLE OF NOTCHES! I know Brookfield has had plans and agreements in place with the transit agencies regarding building the platform. Even so, I have trouble imagining more than two towers fitting on that site. But residential towers don't have to be very large, and will likely have much smaller footprints. The Moynihan project is moving forward, we should be getting plans on that next month. It's just astonishing the amount of commercial space being built on basically two blocks. I guess the developers in Midtown want to strike back early and hard at the WTC, something I don't think happend the first time around. But with the office market as hot as it is in Manhattan, there's not a better time to do it. This and the MSG site are going to make for an impressive cluster! 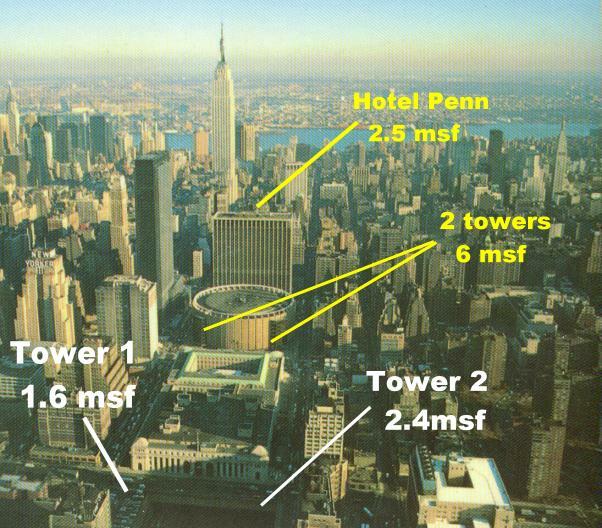 4.7 msf development, Related's 6 msf MSG development, and Vornado's 2.5 msf Hotel Penn tower. But Brookfields site is somewhat small, considering they want to build four towers. the potential to be taller than the tower at the Hotel Penn site. Actually the base can be big enough if they do the "Bloomberg or Time Warner Center" thing where two towers share a large common base. That could only happen if you build both towers at the same time, the way Time Warner Center was built. 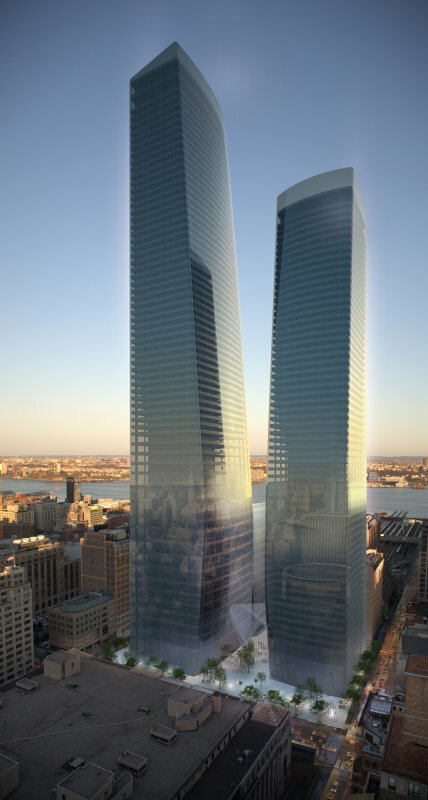 I believe the Hudson Yards zoning calls for pedestrian circulation (either indoor or inclosed) between the towers, where there is no 32nd street (the same thing called for at the MSG site). But either way, the site is too small. You would need to extend the base all the way to the western edge of the site, where apparently they want to build two residential towers. I'm constantly going through the site (entering and leaving Penn Station) and at best it's suited for two towers. But if they're looking to go up, they can cram all the space they want to in there (zoning calls for 4.7 msf). So in a few years, the ESB could actually be obscured behind several taller towers... quite a change for New York that would be. Probably the most significant since the Chrysler and ESB were constructed, actually. Somewhere between Child's clarity and Libeskind's dazzle lies the future. I believe hes referring to Midtown only. The WTC never obscured the views of either. 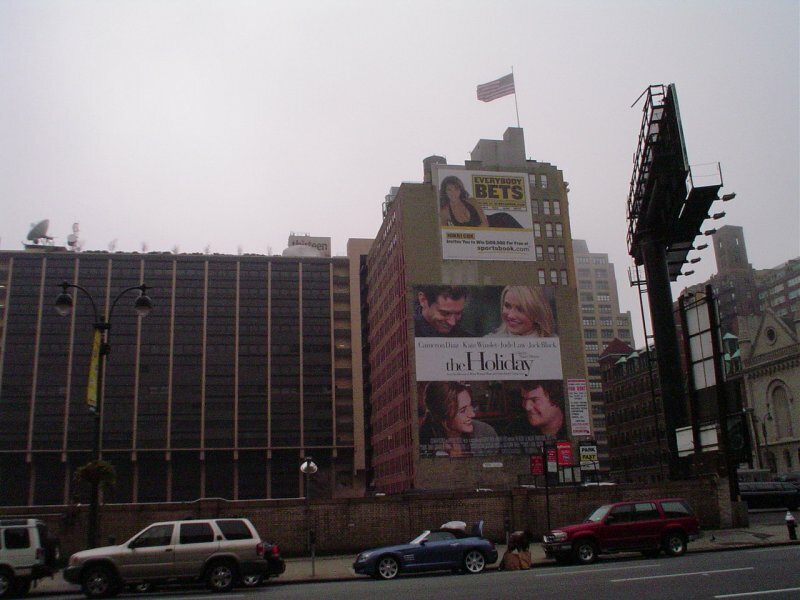 Man, next time I come in by way of Penn Station I'm gonna make sure I take pictures of all the surrounding blocks, before they all get redeveloped with 600+ footers and the place becomes unrecognizeable from what I (will) remember as a youngster. Pretty soon the Nelson Building will look like a midget after years of dominating its territory.. neato! That would be quite a change. For so many years, the Empire State has dominated Midtown. And nothing in the immediate area even comes close. It was the world's tallest for about 4 decades, and is the only former tallest to hold the title of a city's tallest on two seperate occasions. Yet, the day of the ESB's dominance may be coming to a close. Midtown developers want to offer the same type of space being offered Downtown at the new WTC. It's no coincidence that most of these towers have the same target dates of completion (and are all actively seeking tenants, something done years ahead in New York). What surprises me is that of all the new towers in the area, I thought the Hotel Penn tower would sprout first (they're shooting for 2011). 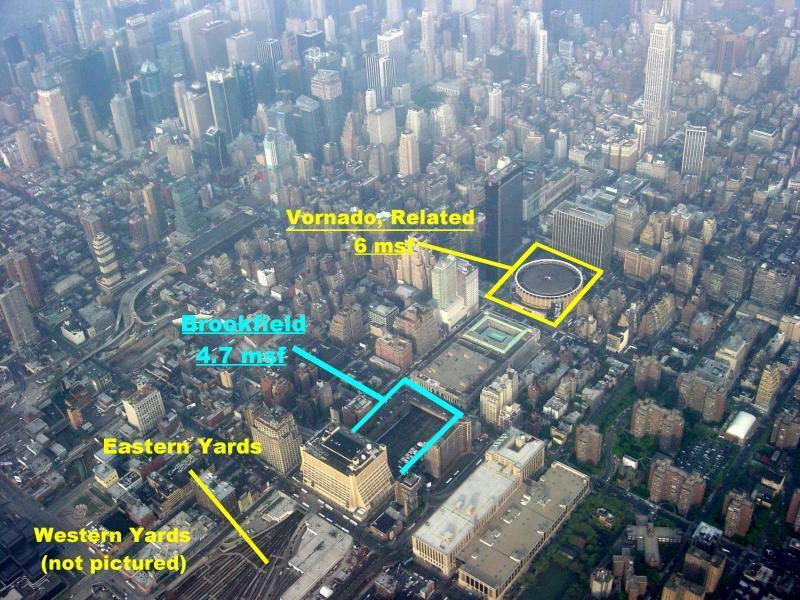 Who knew Brookfield would trump both Vornado's tower and Silverstein's WTC towers?